Sweet Fancy Treat: Ok, Maybe A Bit. Bit Bit. When I woke up this morning everything outside was still and covered with a thin layer of white powder. I'm afraid to name it, snow, because it might melt away. Shh! Some bits survived on the street where nobody stepped and not a car passed by. I was sitting in kitchen and enjoying my cake&yoghurt when I saw what a wonderful shade the sky was turning into. 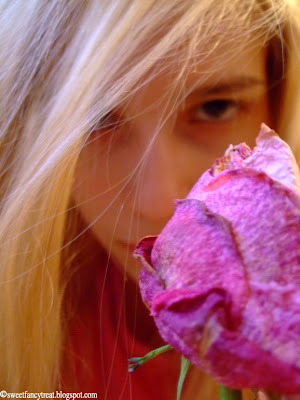 It was similar to the one of the rose in the photo above. I love keeping flowers long after they have all dried. Some of them keep being beautiful just in faded shades. Yesterday I went into an accessories shop and noticed a beautiful rose brooch. It was so similar to a real one, it was stunning. Unfortunately, it was a blue rose, and it seemed so unnatural that I didn't buy it. Brooches are such a special touch to most outifts. And if subtle elegance goes with everything, why mess with success? Good thing I have the real deal at home, placed right on my desk.